It’s an obvious, well-known fact that data and business go hand in hand. You can’t manage one without affecting the other. And whether you’re analyzing a client’s data or using your company’s data to make executive decisions, your tools have to be able to handle the tasks you perform with that information. While these may be impossible to handle manually, they’re perfectly manageable with Microsoft Excel. The application is advanced yet user friendly enough for the average user. However, the tricky part you probably struggle with is knowing how to access and apply the right functionalities to your data. Well, it’s time to stop the struggle. 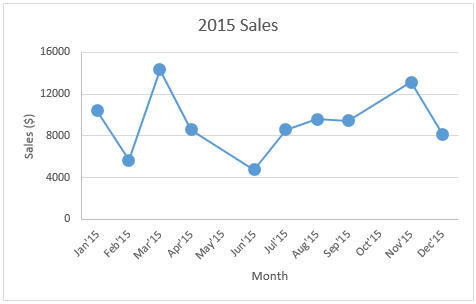 In this post, I’ll show you some Excel tips you can use at each of the data analysis stages. Click through to jump to a specific section or tip. 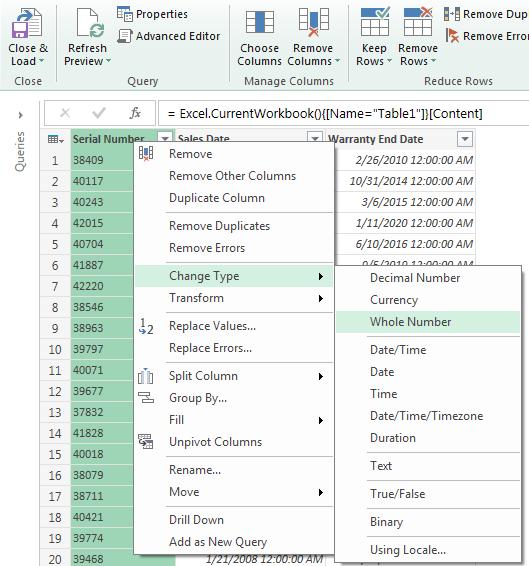 With each of the tips for data cleaning, you’ll learn how to use a native Excel feature and how to accomplish the same goal with Power Query. Power Query is a built-in feature in Excel 2016 and an Add-in for Excel 2010/2013. This Add-in helps you to extract, transform, and load your data with just a few clicks. 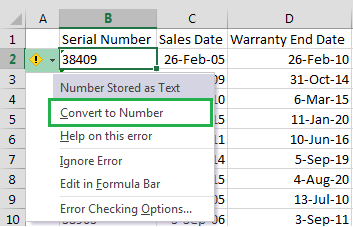 Note: Within Excel 2016, the Power Query features can be found in the Get & Transform group of the Data tab. Use this link to get more information about Power Query or to download it. For the following tips, I’ll assume that you already have the data within Power Query. Depending on your computer and the number of values in the range, you can quickly convert the values to numbers by clicking on ‘Convert to number’ within the tooltip options. However, if there are more than 1000 values, you’ll need to wait a couple of seconds while Excel finishes the conversion. Select the range with the values to be converted. 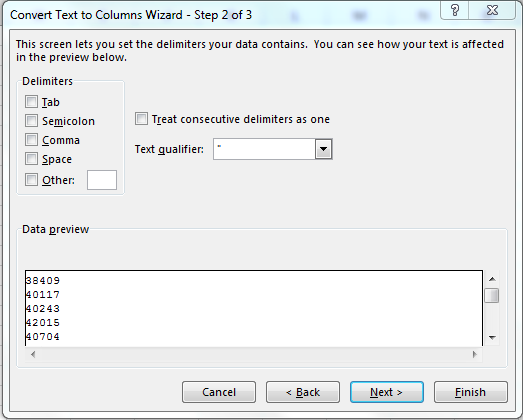 Go to Data > Text to Columns. Uncheck all the checkboxes for delimiters (see below) and click Next. 5. Then select General and click on Finish. When you have lots of numbers to convert this tip will be much faster than waiting for all the numbers to be converted. 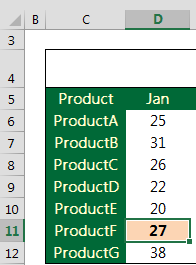 Right click on the column header of the column you want to convert. Then select the type of number you want (Decimal, Whole Number, …). If you’re going to create a PivotTable or use any statistical package, it’s strongly recommended to have each variable on a single column. For example, if you’re creating a PivotTable of shipments you need to have all the shipment values in the same column. Unfortunately, you won’t always receive the data in that tidy format. You can accomplish this using multiple consolidation ranges in Excel or using Power Query. -Select ‘Multiple consolidation ranges’ and click Next. 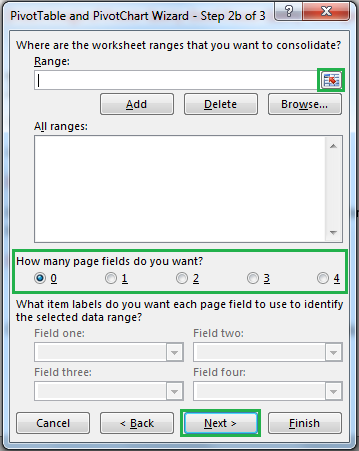 – In the next step, select ‘I will create the page fields’ and click Next. You might want to add proper column names to the table, since the default names are: Row, Column, and Value. – Select the columns you want to unpivot. 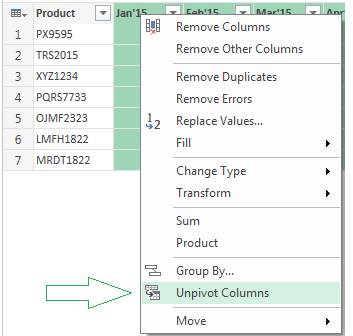 – Right click and select Unpivot Columns. Notice that if you have several columns that won’t be “unpivoted”, using Multiple consolidation ranges will require additional steps. However, with Power Query you just need to follow exactly the same steps explained here. 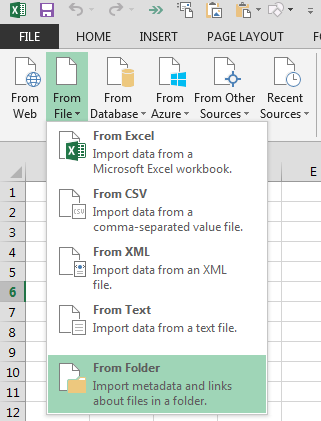 Sometimes the data is stored in several csv (Comma Separated Value) files that need to be imported and merged into a single worksheet. 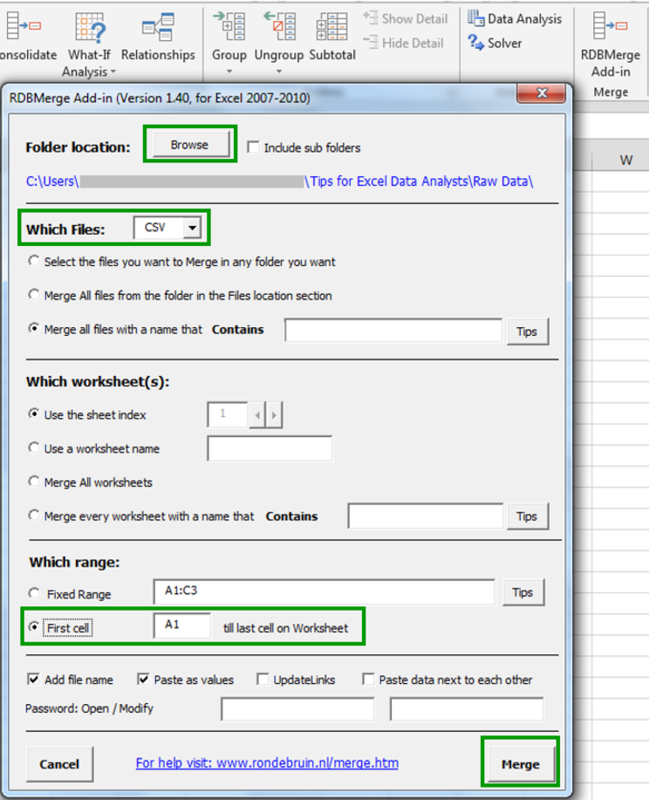 One possible way of doing this is by using RDBMerge (a free Excel Add-in) created by Ron de Bruin. This Add-in can be downloaded for free from Ron’s website where you can also find steps to install the Add-in. Go to Data and click on ‘RDBMerge Add-in’. Within the dialog box, click on Browse. Browse to the folder and press OK. The path to the folder will appear in the top part. Select CSV from the Which files dropdown list. Select cells range you want to extract. To import the whole file, select First cell. 1. Within the Power Query menu go to the ‘Get External Data’ group select ‘From File’ and then ‘From Folder’. 2. Click on ‘Browse’ and browse for the folder that contains the files you want to import. Click Ok. 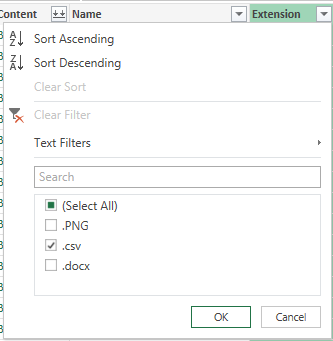 If there are other files within the folder that are not CSV, go the columns ‘Extension’ and select “.csv”. 3. Click on the double down arrow button in the Content column. All the csv files will be appended together. 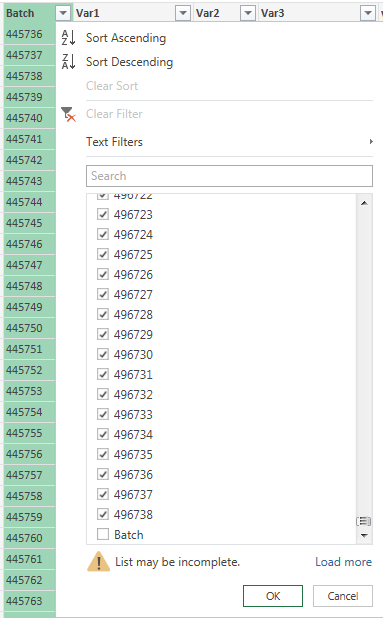 If the files have header rows, you can exclude them from the data using the filters. In this particular example, the header row contains the word “Batch” in the first row of each file. The header rows can be excluded by unselecting the word “Batch” from the filter. These empty spaces cause a lot of problems when using PivotTables or lookup functions. Therefore, to use this data set you need to complete the empty spaces with the content above. a) Select the range with the empty spaces (You can select the whole columns if it is easier). 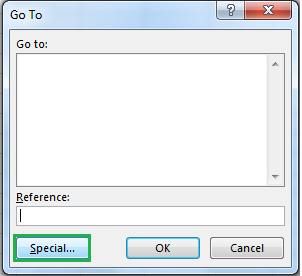 b) Press Ctrl + G (This will show the “Go – to dialog box”) and click on Special. c) Click on “Blanks” and press OK.
d) Type “=” and select the cell just above the active cell. e) Press Ctrl + Enter. a) Within Power Query select the columns where you want to fill the empty spaces. b) Right-click on the header of any of them. c) Go to Fill > Down. As you can see, Power Query makes the data cleaning process extremely easy. Best of all, once you perform the cleaning steps, Power Query will store them and you can repeat them whenever you want for other data sets. Now that you know some data cleaning tips, let’s see some data analysis tips. 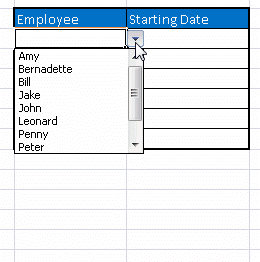 Formula Auto Fill: Once you enter a formula in a table it will be automatically be copied to the rest of the table. 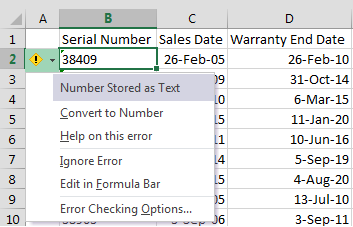 Auto Expansion: New items typed below or at the right of the table become part of the table. Visible headers: Regardless of your position within the table, your headers will always be visible. Automatic Total Row: To calculate the total of a row, you just have to select the desired formula. 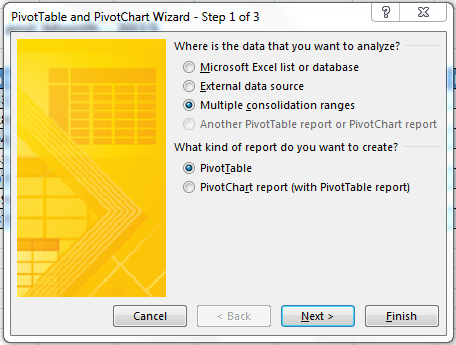 If you use a Table as the source for a PivotTable, all information included below and at the right of the Excel Table will automatically become part of the data source of the PivotTable. To display the new information in the PivotTable, just right-click any cell inside the PivotTable and click on Refresh. Read this article for details on how to create dropdown lists and how to use tables as a source for them. When you use Excel Tables as the source of dropdown list the items you add to the table will be part of the dropdown list immediately. Like in dropdown lists, if you have a formula that depends on a Table, when you add new items to the Table, the reference in the formula will be automatically updated. Charts will be updated automatically as well if you use an Excel Table as a source. As you can see, Excel Tables allow you to create data sources that don’t have to be updated when new data is included. The first function you need to know is INDEX. 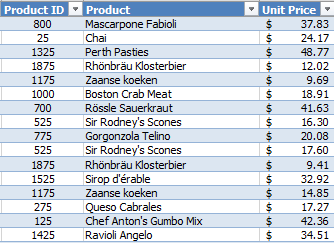 INDEX will return the value from a range (row, column, or table) corresponding to a position. The formula =INDEX(D6:D12, 6) will return the value from cell D11, because D11 is in the sixth position of the range that contains the cells D6, D7, D8, D9, D10, D11, D12. =INDEX(D6:O12, 5, 6) because the value corresponding to “ProductD” on “Jun” is on the 5th row and 6th column of the range D6:O12. You might be thinking “This seems pretty interesting but I should not have to be plugging in the position of the row/column in order to get the right results” and you’re totally right! That’s the purpose of the MATCH function. The MATCH function will return the relative position of a value within a row or column. There are three types of search in MATCH, however, I’ll focus on an exact search since this is the type used 99.9% of the time. To use exact match, enter a zero (0) in the last argument of MATCH. you will get a 5 because “ProductD” is on the 5th position of the range C6:C12. you will get a 6 because “Jun” is on the 6th position of the range D5:O5. If you work with SUMIF(S)/COUNTIF(S), you know that SUMIFS/COUNTIFS allow to sum/count items based on AND criteria. you will sum all the values in the range B1:B50 that are greater than 5000 AND whose corresponding value name in column A is “Bob Williams”. But, what if you want to sum the values in column B1:B50 for a list of names? 1. Place the range with the list of names in the criteria argument of the SUMIF. (are from “Jill Love” AND are <3500). 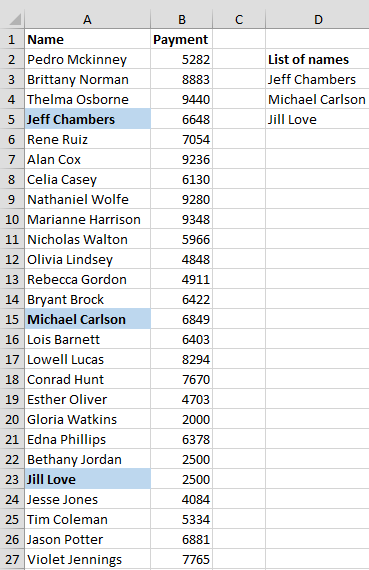 It’s extremely easy to count unique items in a table using the Excel Data Model. The Excel Data Model is an approach for building relational data sources in Excel. This is applicable for Excel 2013 or later. In other words, for each category I want to count each product only once regarding how many times they have been bought. 1. 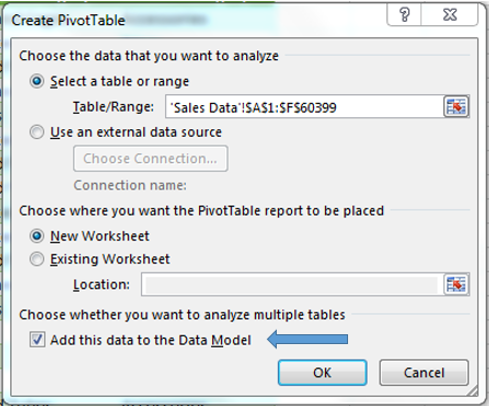 Open the PivotTable dialog box (Go to Insert -> PivotTable), select the data source and check on “Add this to the data model”. 2. Insert all the desired fields for the PivotTable (Row fields, Columns fields, and values fields). a) Right-click on any value of that field. b) Go to “Summarize Values by” > More Options > “Distinct Count”. 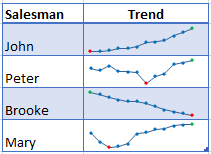 Sparklines are a visualization feature of MS Excel that allow you to quickly visualize the overall trend of a set of values. Sparklines are mini-graphs located inside of cells. As you can see is kind of difficult to determine what’s going on (who’s selling steady, who has an increasing trend, who’s more volatile,…) just by looking at the numbers. An easy way of quickly teasing out the information is by using Sparklines, as shown below. 1. Select the range that contains the data that you’ll plot (This step is recommended but not required, you can select the data range later). 2. Go to Insert > Sparklines > Select the type of sparkline you want (Line, Column, or Win/Loss). For this specific example I’ll choose Lines. 3. Click on the range selection button to browse for the location of the sparklines, press Enter and click OK.
Make sure you select a location that is proportional to the data source. For example, if the data source range contains 6 rows then the location of the sparkline must contain 6 rows. And that’s all! 1. Click on any cell within the sparkline to show the Sparkline Tools menu. 2. 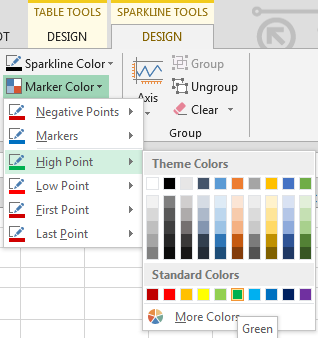 In the Sparkline tools menu, go to Marker Color and change the color for the specific markers you want. a) Example: High points on green, Low points on red, and the remaining in blue. 2. In the Sparkline tools contextual menu, go to Sparkline Color > Weight and change the width of the line as you desire. Have you ever wanted to automatically change the title of a chart based on a reference? 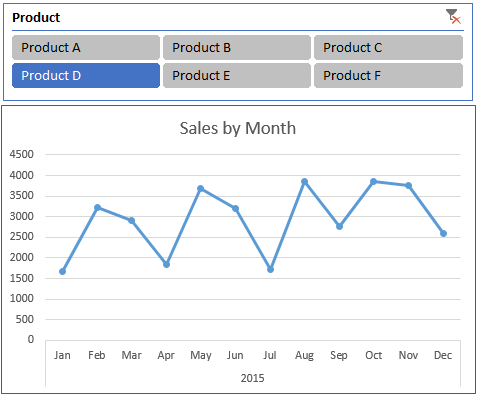 For example, let’s say that you have a PivotChart for the monthly sales of a product and you would like the title of the chart to reflect the name of the product that is being plotted. In the PivotChart above, the title of the chart will remain the same regardless of the product selection. However it would be best if the title changes when the product selection changes in the slicer. For example, if the user selects Product D, then the title of the chart would be: Product D Sales; if the selection is Product C, then the title of the chart would be: Product C Sales. 2. Click on the title of the chart. 3. Type ‘= cell where you created the title formula’. For example, if the title is on cell G1 you should type ‘=G1’. Now every time you change the report filter your chart title will change. The previous graphs correspond to sales data where unfortunately there was no information available for May’15 and Oct’15. 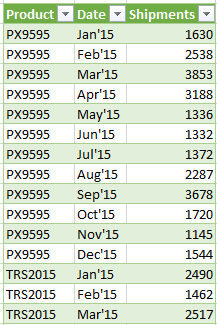 In scenario A, the cells for May’15 and Oct’15 are empty and Excel shows the graph with empty spaces. 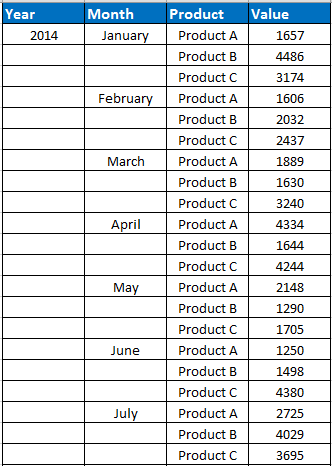 In scenario B, I typed zero (0) in the months without data and then Excel shows zero sales. If you have lots of empty cells, rather than going one-by-one, use the Ctrl + Enter trick I showed in tip #4 of this tip. When using this trick, instead of typing ‘=cell above’ you need to type =NA() and press Ctrl + Enter. 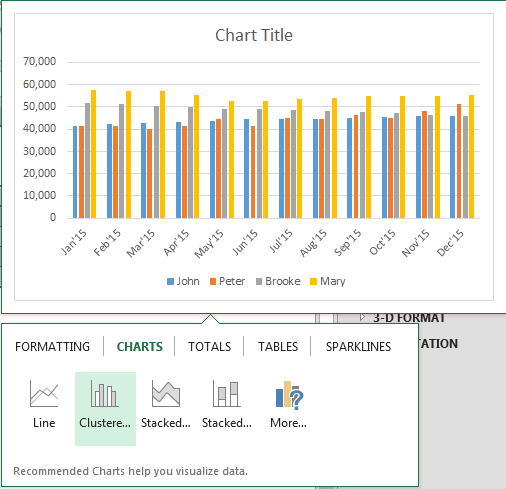 One of the major improvements introduced back in Excel 2013 was the Quick Analysis feature. This feature allows you to quickly create graphs, sparklines, PivotTables, PivotCharts, and summary functions by just clicking on a button. 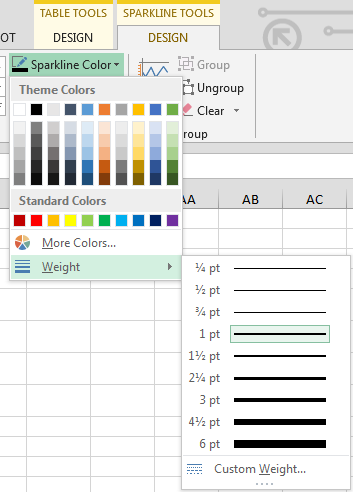 When you click on any of the options, Excel will show a preview of the possible results you could obtain given the data you selected. If you click in the Quick Analysis button and go to charts, you could quickly create the graph below just by clicking a button. As you can see, the Quick Analysis feature really allows you to quickly perform different visualizations and analysis with almost no effort. This is just the tip of the iceberg. 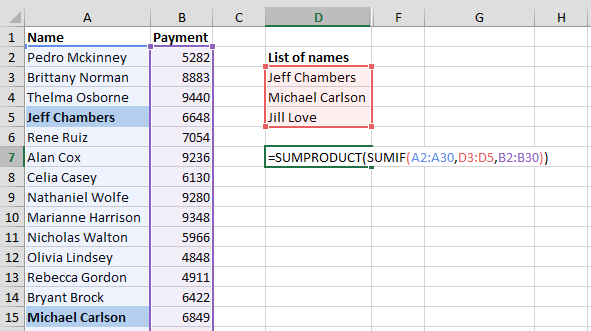 Excel has many more features to help you perform data analysis tasks more efficiently. Whether you need to visualize complex data or organize disparate numbers, Excel is the perfect tool to get your data in order. About the Author: Orlando Mezquita is certified as Microsoft Office Specialist Expert in MS Excel 2003, 2007, and 2010. He owns and maintains the website www.masterdataanalysis.com. In addition, he provides training of business analytics using MS Excel, Minitab, and the R programming language.